In the move to version 18, Altium decided to drop much of the FPGA-design support it had offered previously on the basis that almost all teams use the implementation tools that are provided by the IC vendors. What stays is the support for pin-swapping “as it’s part of PCB design”, Jordan said. The rewrite has come with an overhaul of the user interface, which also takes advantage of the workstation’s graphics processing unit (GPU) to speed up redraws, and changes to the ActiveRoute interactive router. In common with other PCB tools, the router will handle tasks such as matching the trace lengths of differential pairs by creating serpentine paths automatically. 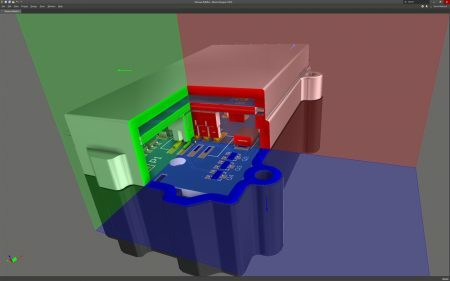 “The flagship new feature is multi-board assembly,” Jordan said, noting that the graphics improvements help performance when showing the 3D interactions between boards in an assembly. One of the problems happens when header connectors are reversed into place when the boards are mated and the pin assignments turn out to be mismatched because the part library has one of the connector numbered incorrectly. “We realised that connectivity management is the most important thing to watch. It’s even more important than the physical alignment. With the multi-board support, you can bring multiple modules into a single, higher-level design and specify how they are interconnected electrically,” Jordan said. Further updates have been made to the ActiveBOM engine to make it more flexible and take account of the inevitable changes in supply-chain dynamics as board designs move to production. “Most CAD tools generate a bill of materials [BoM] from the design as an afterthought. Someone then has to resolve that list with the actual solutions in the supply chain,” Jordan explained. “Treating it as a post-process causes all sorts of pain. Design teams were constantly designing things in that seemed to be available but finding with the production quantities required they couldn’t get the parts or that the parts had been flagged as not recommended for new designs.